In total, logging businesses that responded to survey worked on over 3,000 timber sales in 2016. 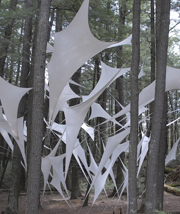 We estimate that their work affected over 125,000 acres with an average timber sale size of 42 acres. In comparison to the prior surveys (2003 [blue] and 2010 [red]), the distribution of timber sales by timber sale area in 2016 [green] looks similar to that in 2003 (chart below). Why 2010 looks different may relate to the poor economy at the time. Larger sales offer greater economies of scale (i.e., lower per volume costs because fixed costs are spread over more volume). In addition, the poor economy may have led smaller businesses to temporarily leave the sector or substitute other employment until conditions improved. This would have been easiest for businesses that relied on hand-felling and that didn’t have high capital investments in equipment. In further analyzing the 2016 data, we separated logging businesses that relied primarily hand-felling from those that were mechanized (i.e., traditional, cut-to-length). Hand-felling is primary for 30% of the logging businesses in our survey. Collectively, these businesses worked over 660 timber sales and impacted over 21,000 acres. The average timber sale area was 36 acres. The distribution of sales by timber sale area and annual harvest volume is below, but notably, the most sales were completed by businesses cutting 1,001-5,000 cords. Note that due to the small number of respondents in the three largest annual harvest categories, these were consolidated into a single group, 5,001+ cords, for reporting. Mechanized logging businesses worked on the remaining 70% of timber sales, which totaled over 2,400. These sales touched over 105,000 acres. 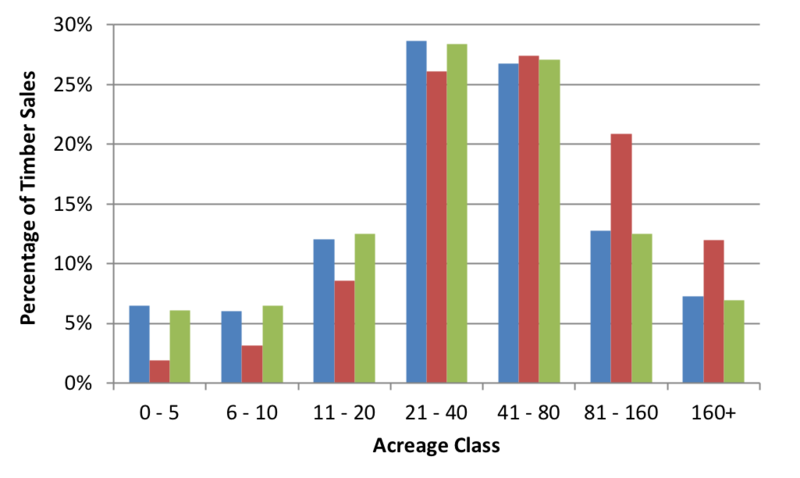 The average timber sale area–45 acres–was almost ten acres higher than for hand-fellers. 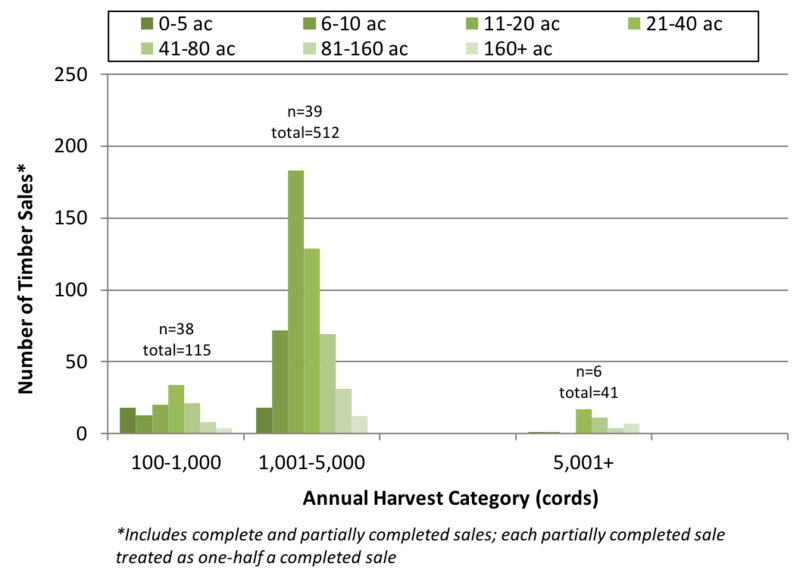 The distribution of sales by timber sale area and annual harvest volume is below. The largest logging businesses (15,001+ cords) worked on the largest number of sales, with only 22 businesses in that category (34 sales per business). 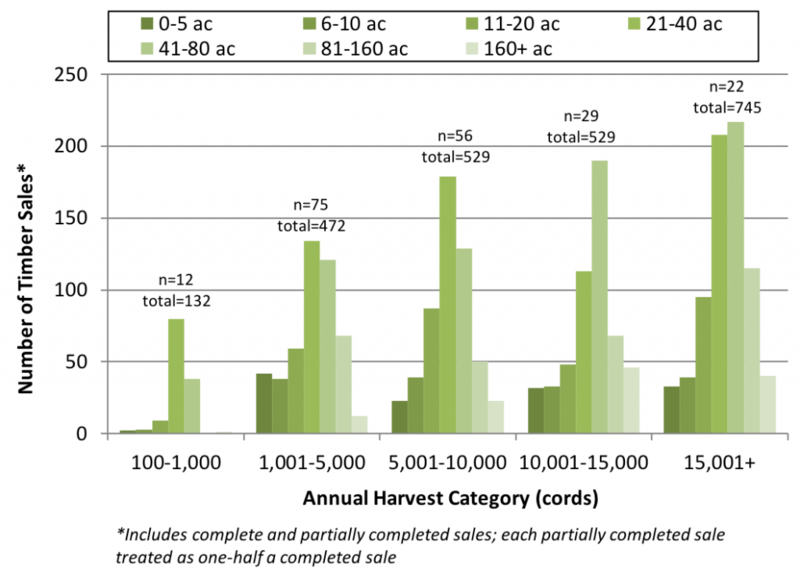 This compares to the next two largest annual harvest categories, 10,001-15,000 and 5,001-10,000 cords, with 56 and 29 businesses, and 18 and 9 sales per business, respectively.